TAGLINE: The Blade is Back. FILM: I've only just seen the first three installments of the Puppet Master series within the last month and when this Blu-ray of the long-awaited 9th installment of the series floated across the McBastard's Mausoleum HQ desk this reviewer was mighty excited. I think perhaps only seeing the first three films worked in my favor as Axis of Evil takes place following the events of my personal favorite installment of the series - Puppet Master 3: Toulon's Revenge (1991) and seemingly dismisses everything else. A lengthy pre-credit sequence takes place (where else?) at the Bodega Bay Inn, the year is 1939. We even get that same exterior shot of the Bodega Bay Inn full of dirt and grain as seen in PM1-3, nice. We meet Danny who is a carpenter's apprentice at the Bodega Bay Inn. He's a patriotic young man eager to fight the "krauts" and "japs" in good ol' WW2 but he's stricken with polio and has been rejected. This is taking place the same day as the beginning of PM 1 and we're treated to footage from that film as series-icon Blade makes his way to Toulon's room right up to the point that Toulon's blows his brains out and the Nazi's bust-in. This is where we diverge from the 1st film and meet Klause and Max, the two Nazi's ransack the room looking for Toulon's reanimating serum but leave empty handed. Soon after Danny arrives and discovers Toulon's corpse. Knowing of Toulon's secret panel he removes the trunk and returns to his home in Chinatown where he lives with his mother Elma (Erica Schaffer) and enlisted older brother Dan (Taylor Graham). Opening credit roll as we are treated to a re-working of Richard Band's awesome Puppet Master theme. I won't spoil any more of the film other than to say it involves the Nazi's teaming-up with a Japanese conspirator in an effort to strike a blow against the American war effort. Puppet Master: Axis of Evil is a good looking film - more so than any Full Moon Features I can recall though I haven't seen a lot. Having Decoteau back in the directing chair was a great decision as he creates an effective and nostalgic late-30's period look on a budget. The scenes of the Nazi's walking through the fog-laden streets of Chinatown looks great. The film was shot in a scope aspect ratio which must be a 1st for Full Moon who are not known for their extravagant budgets and presentation. The characters are well developed and the acting is pretty decent, particularly that of Danny, his girlfriend Beth and the Nazi Max, good stuff. And let me just say that Jenna Gallaher (Nightfall) who plays Beth is a gorgeous woman. What didn't work for me was the actual iconic Puppets themselves. We get Blade, Jester, Ms. Leech, Tunneler, Pinhead, the Asian puppet from the 1st film and Six Shooter makes an underwhelming appearance, I don't recall seeing Torch. Something I've long heard about the PM films is that Six Shooter and Torch were under utilized in the latter films due to budgetary constraints which is a bummer. I think Six Shooter may be the best of the bunch and to continue a series and omit these iconic characters is a real shame. This film introduces a new character to that cast of stringless marionettes but it is uninspired and a letdown. The design of the character just feels lazy. Sorely missing is the stop-motion artistry of visual effects maestro Dave Allen whom did the effects for PM 1-5. 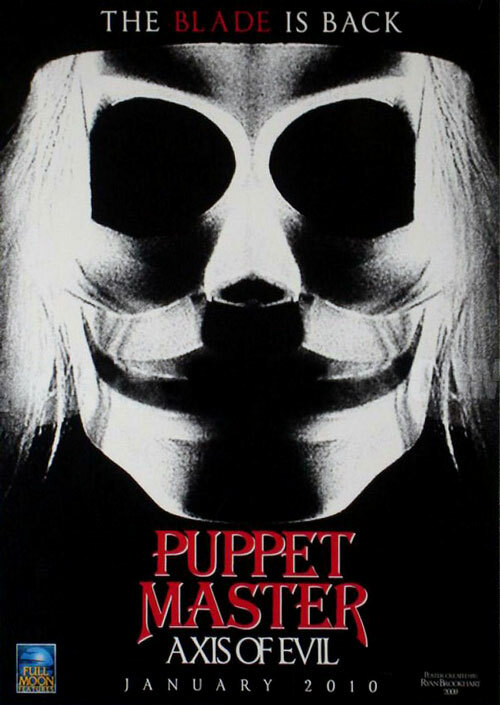 I really enjoyed his work in PM 1-3 and especially Puppet Master 2 (1991) - which he directed - which while having it's fair share of flaws I cannot deny that the puppets movements were fluid and looked amazing. Here the puppets are under utilized and rather poorly articulated. Another sore spot for me would be that the kills are lackluster and almost completely without gore. When the best kill is Toulon's death which itself was recycled from PM 1 you know there's a problem. I get the feeling that so much thought went into the production design and storytelling that the Puppets and the more visceral elements of the franchise suffered for it. The Nazi saboteur storyline is interesting and well-done but the film is not creepy or horrific in the least and for a Puppet Master film this I cannot abide. BLU-RAY: To celebrate Puppet Master's 20th Anniversary Full Moon have given both Puppet Master (1989) and Puppet Master: Axis of Evil (2010) the high definition Blu-ray treatment. 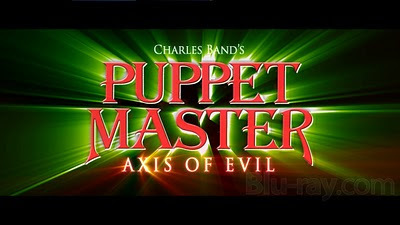 Puppet Master: Axis of Evil is presented in 1080p HD 2.35:1 anamorphic widescreen with 5.1 surround. While not reference material by any means its definitely the best looking of the series, by far. It's a good looking clean print with crisp detailed picture. The 5.1 surround is not overly active but Richard Band's score sounds great, I've always been a fan of his scores and the Puppet Master series is one of his best. There are 3 bonus features included, none of which are presented in HD. Of the two featurettes the original No String Attached featurette is my favorite. The Making of Evil is non-essential but I really enjoyed the 9 Puppet Master trailers as I've not seen PM 4-8.